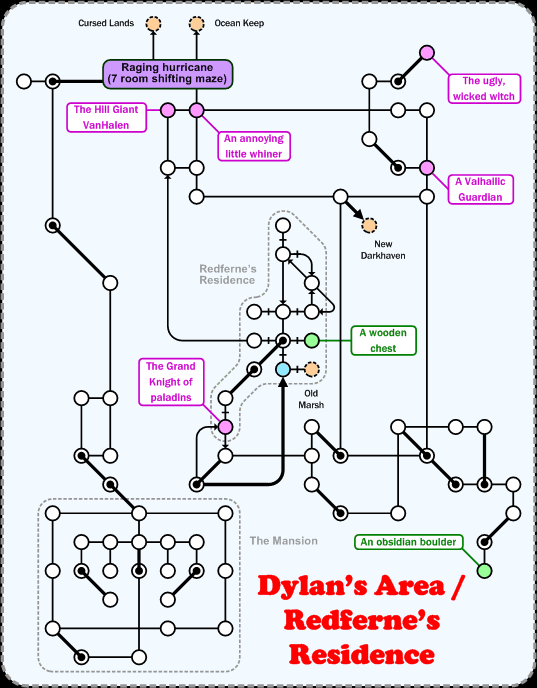 Dylan's Area / Redferne's Residence. The entrance is through Redferne's, in the centre of the map. Everything else is Dylan's area. Walk ( 6s, ne, 2s, se, 2e, s, 2sw, s, 4sw, 4s, 5se, 2s, d, s, se, s, 3sw, u, 3w, s, sw, d, 3w, 3n, w, 2s, 2sw, 2w, sw, 2nw, sw, w, sw, 2s, sw, tree, 2e, 3se, 4s, 3e, s, 2w, open w, w ) to get from DH to the room marked in blue.